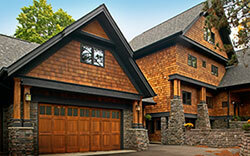 We get most of our doors from Hasser Garage Doors in Braham. Most of the doors are available in 10 days or less. We have many small parts for repairing overhead doors in stock. Springs, replacement panels, insulation kits and opener parts are normally purchased from Hasser. They are located less than a half hour from Mora, so products can normally be found quickly if we don't have them in stock. Give us a call or send an email with any questions.